Threats of high winds and flooding from Hurricane Sandy are forcing Orbital Sciences Corp. to suspend tests of its Antares rocket and secure facilities at a coastal launch site in Virginia, a spokesperson said Friday. The Antares rocket's first stage was moved Oct. 1 to the launch pad at Wallops Flight Facility on Virginia's Eastern Shore for several weeks of testing, fueling exercises and an engine hotfire ahead of the new launcher's first liftoff. According to Barron Beneski, an Orbital spokesperson, workers at the coastal launch site are sealing doors on the Antares horizontal integration facility and closing access doors, disconnecting propellant lines, and safing systems on the rocket's first stage on launch pad 0A at Wallops. The Antares first stage, designed by Yuzhnoye and built by Yuzhmash in Ukraine, will remain on the launch pad, Beneski said Friday. Parts for two more Antares rockets are housed inside Orbital's hangar about one mile from the pad. As of 2 p.m. EDT (1800 GMT), Hurricane Sandy was centered about 30 miles east-northeast of Great Abaco Island in the Bahamas. The 2 p.m. EDT advisory from the National Hurricane Center said the storm had maximum sustained winds of 75 mph and was moving north at 7 mph. The forecast calls for Hurricane Sandy to make landfall between Virginia and New York on Monday or Tuesday. The Antares processing infrastructure weathered Hurricane Irene in 2011 with little effect. "We've had practice at this, but there is a new wrinkle in that we have an Antares first stage on the pad now," Beneski said. Engineers planned to load propellant into the Antares first stage as soon as this week, but Hurricane Sandy will delay the rocket's test schedule by at least several days. After the hurricane passes, workers will resume Antares testing ahead of a 30-second firing of the first stage's two AJ26 engines. Several propellant loading, or cold flow, tests are planned before the hotfire to demonstrate the launch pad's fueling systems and rehearse countdown procedures. Once the first stage tests are completed, Orbital will swap the vehicle for a full-up Antares rocket for a demonstration flight. 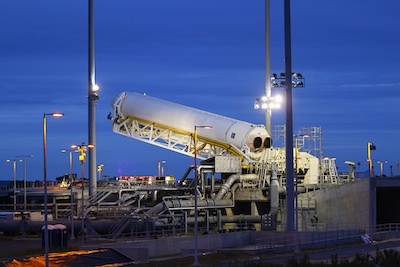 Orbital Sciences aims to conduct the first test launch of the Antares rocket before the end of 2012. The company is developing the two-stage vehicle and a robotic cargo freighter to deliver supplies to the International Space Station under a $1.9 billion contract with NASA.